UGA researchers have seen reduced field efficacy in Bt corn in Georgia. We have also seen reduced efficacy of the original Bt toxin in bioassays for CEW collected in Georgia. Basically what is happening is CEW is/has developed resistance to the Cry1Ac gene. 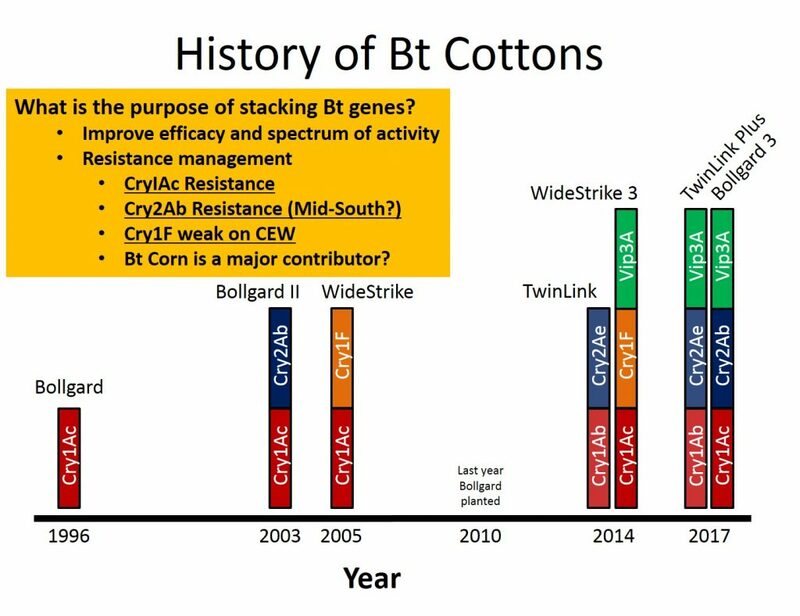 If the original Bt gene is no longer providing control of CEW, our 2-gene Bt cottons (Bollgard 2, WideStrike, and TwinLink) will be relying on a single gene and overall efficacy will be reduced. There is variability in performance of Bt cotton technologies. The chart below illustrates relative efficacy of commercially available Bt technologies. 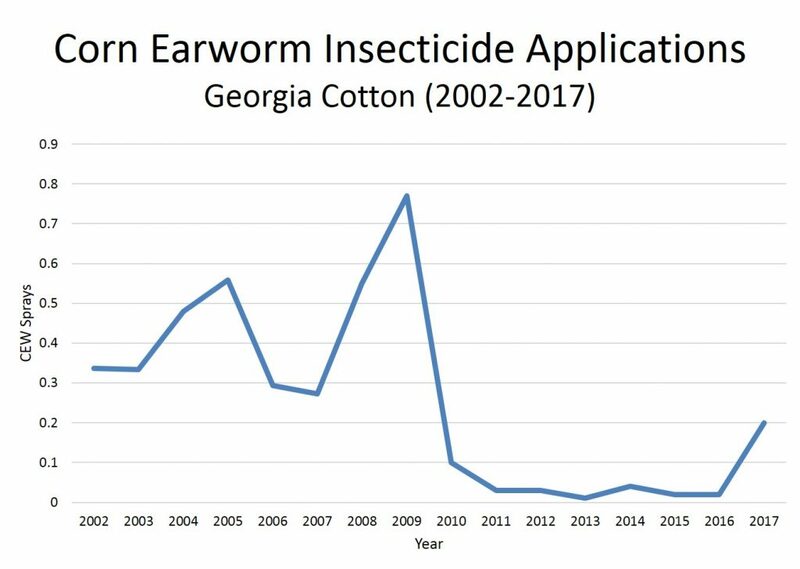 Note that all Bt technologies continue to provide excellent control of tobacco budworm! 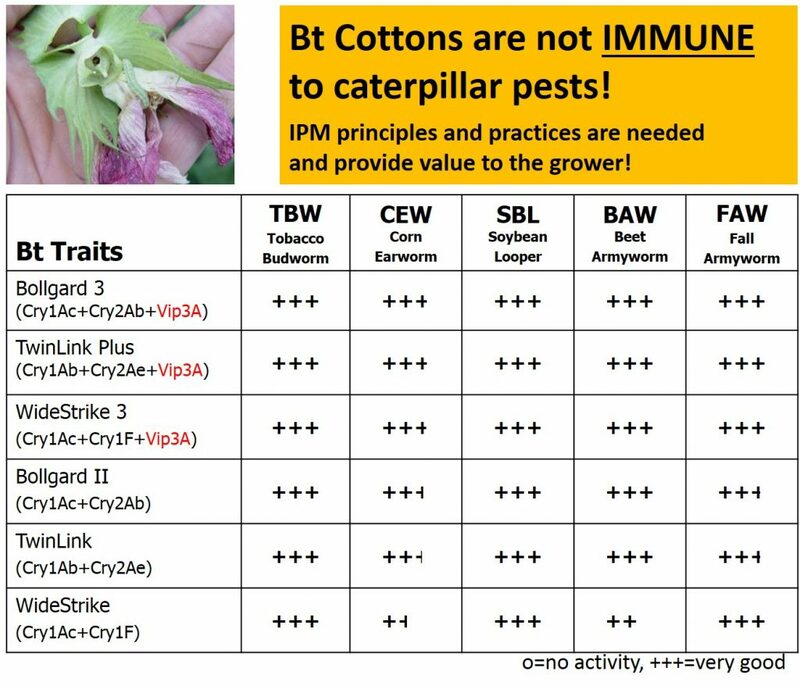 Bottom line is that all Bt cotton must be scouted on a regular basis and growers must be prepared to act accordingly if thresholds are exceeded. When scouting pay close attention to blooms, bolls with stuck bloom tags, and small bolls. 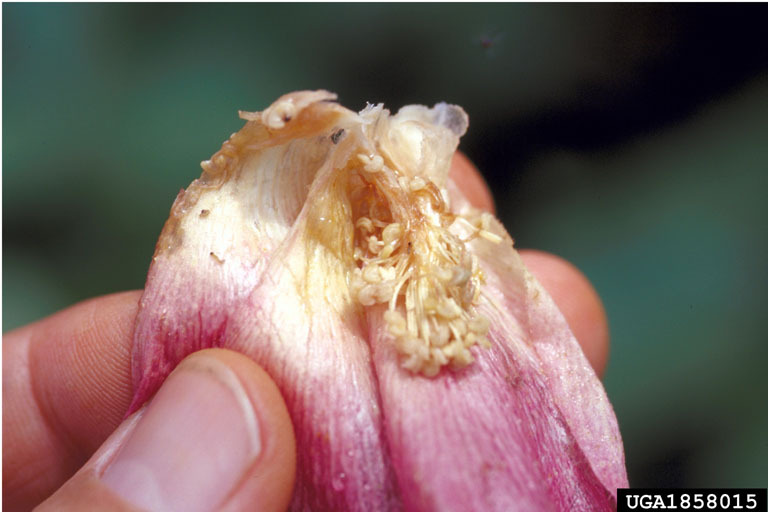 When corn earworm escapes occur in Bt cotton they are usually observed near or just below the uppermost white bloom. 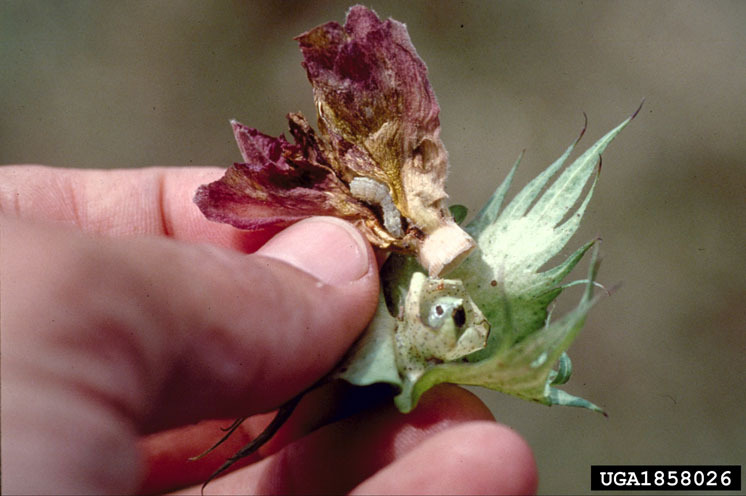 The threshold for CEW in Bt cotton is when 8 larvae ¼ inch or greater are found per 100 plants. We recommend scouts search the top 12 inches of plants and one bloom, one bloom tagged boll, and one small boll per plant. Remember that larvae must hatch and feed on the plant to ingest the Bt. However if larvae reach ¼ inch in length survival is likely. React in a timely manner with supplemental foliar sprays if thresholds are exceeded. Coverage and penetration of the canopy with insecticides will be important as escaped CEW will be down in the canopy. CEW larvae in bloom and bloom tagged boll (photos by Ron Smith ipmimages.org). Only spray other pests (i.e. stink bugs) based on thorough scouting and appropriate thresholds. Conservation of beneficial insects such as bigeyed bugs will reduce the risk of CEW issues. This entry was posted in Insect Management. Bookmark the permalink.